"This is an excellent vegetable dish from Sierra Leone. 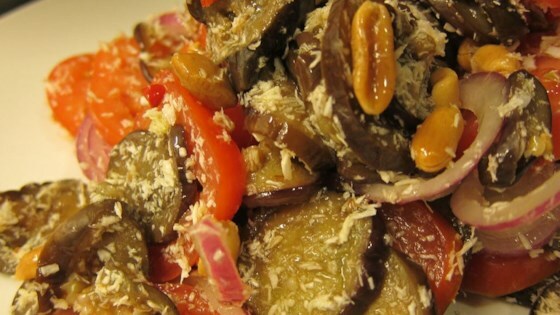 A tantalizing marinated eggplant and tomato salad tossed with coconut and peanuts just before serving for an exotic crunch." Absolutely outstanding! I cooked the onions w/ eggplant & added ~ 1/2 tsp coriander. Used cashews instead of peanuts. My husband, who is not an eggplant lover couldn't get enough. Excellent! I took the 'advice' from a reviewer here and changed the peanuts to cashews-good!